One of our aims when we visited Thailand was to try and make sure we did everything as local as possible; travel, food, homestays, volunteering – we wanted to enjoy the real Thai experience as much as we could, even though we weren’t sure it would even be possible any more. Thankfully, it was. One of the real gems of Thailand was the transport. And if you like a bit of adventure, I’d highly recommend you use it. Landing in Bangkok, there was an incredibly efficient airport taxi service in place, with a lady who spoke several languages manning the desk. She collected details on where her customers were going to and paired them with the taxi driver. The price, info on toll fees and expected arrival time were given up front, and an official receipt issued. When you’re jetlagged, this is a real gem – and we were delivered to our rented apartment in good time, without a hiccup. 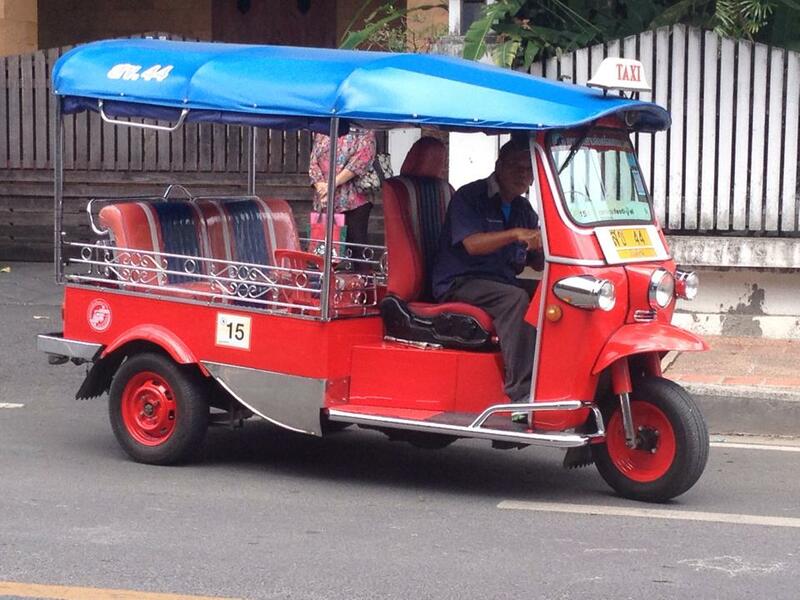 Although iconic, we found the tuk tuks throughout Thailand more of a nuisance than a useful mode of transport. In Bangkok, the drivers were constantly hounding you for a ride and trying to charge you much more than necessary. The constant cry of ‘tuk tuk’ was on a par with the incessant car horn beeping, so you eventually manage to block them out. Yes, people need to make a living, but there’s a fine line between helping out and allowing yourself – and, therefore, others in the future – to get ripped off. We did take two tuk tuk rides over the six weeks, but on both occasions they drove so recklessly, we preferred to use the local bus or Songthaew. Another issue was the ‘souvenir shop’ stop – in Bangkok, the tuk tuk driver will inevitably drop you off at some shop or another that you don’t want to go to so he can earn a fuel voucher. Our driver did ask us if this would be OK, explained we just had to look not buy, and we (naively) thought – sure, help a guy out! We were taken to a shop full of silk. Very expensive silk, might I add. If we’d bought anything we would have had no spending money left for the rest of the holiday – this was our first night! But this information didn’t stop our tuk tuk driver from sulking when we came out empty handed and throwing us out of his vehicle in a random part of the city. Airy sides – but a roof has certain benefits! We like to walk a city anyway, and most of our best experiences in Bangkok came from jumping on the Skytrain to a random area for exploring, then meandering and getting lost. The Skytrain is incredible – efficient and very well air conditioned so you’re nice and cool, even when it’s 35 degrees outside and packed with commuters. The lines and connections are easy to figure out and it’s cheap. The red Songthaew truck taxis were impossible to figure out in Bangkok but they were a saving grace in Chiang Mai, where each one had its route clearly marked on the sides, back and front. If you flagged down the wrong one, the driver would tell you which route to look out for. A note of caution though; although these are open air, you can still suffer from travel sickness! I found this out the hard way on a journey up to the temple of Doi Suthep – where I spent the first twenty minutes retching into the really gross (hole in the floor) toilets. But forget that – the temple and views were incredible and well worth it! 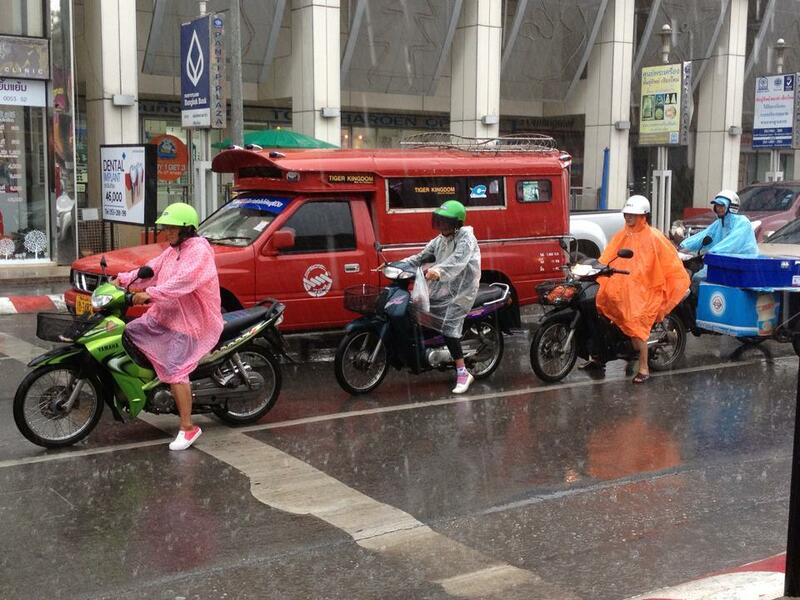 The only transport scam that we got caught up in was one we couldn’t avoid – the driver of the local minibus from Chumpon dropped us at a fake tourist office in Surat Thani in the middle of a storm. They tried to charge us 7x the price of a ticket and wouldn’t tell us where the bus station was. We’d left our guidebook with its map of the town behind with our Thai hosts, as nowhere else we were visiting was listed and we thought it would help with communication when other English speaking visitors passed through. We eventually bartered the scammers down to double the ticket price and went on our merry way – it was worth it to avoid the soaking and only cost us a few euro. 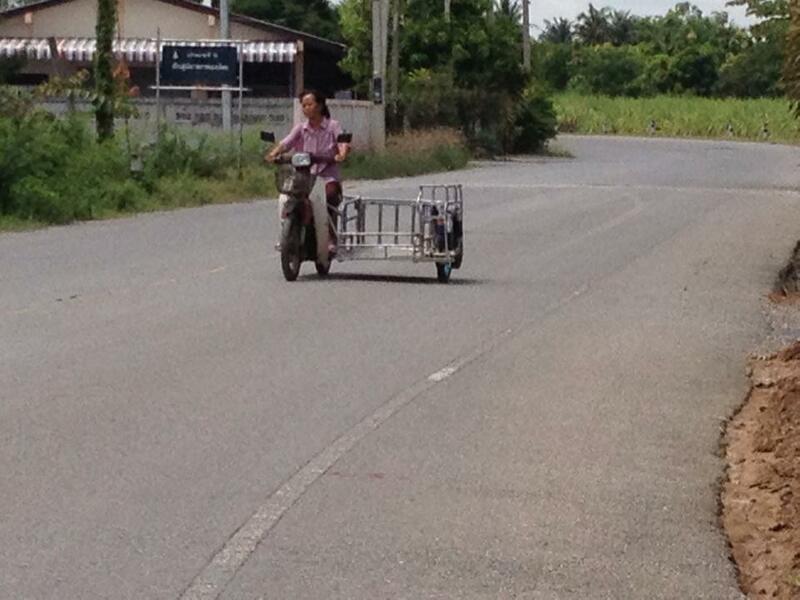 But if you pass through Surat Thani, do watch out for this – it’s a common problem and totally avoidable. Just make sure you don’t give your guidebook away! 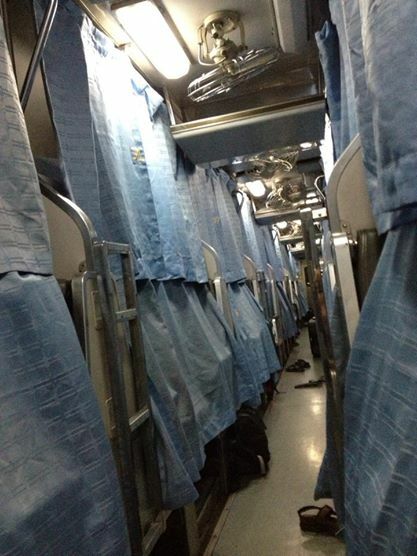 By far the best transport we used was the overnight sleeper train from Bangkok to Chiang Mai. We used this twice and discovered that there’s more than one train type – so bear this in mind when you’re booking your tickets because they differ quite a bit! We were certain we would go for the first class option but ended up plumping for second class. It was amazing! Comfortable, roomy, air conditioned – and watching the beds get set up was a highlight. It went from comfy chair to snug bed in under two minutes – complete with sheets & curtains! Afterwards, we felt a bit grimy without a shower, but fully rested. By far our hairiest journey was in Chumpon, when our arranged transport didn’t turn up to meet us. Eventually, we figured out the mix up, after a very kind ‘taxi’ driver called them for us – they only spoke Thai, and our language skills were limited to ordering a few badly pronounced food dishes. He then explained he would take us for 100 baht for the two of us, when it usually cost 100 baht for one. Very reasonable, I thought, and hollered over to my (hot and wilting) husband that it was all sorted out. However, the taxi turned out to be a small motorbike. That meant two rucksacks, two passengers and one driver on one small vehicle that seemed to be powered by a hairdryer motor. There was no other option, so we managed to squash on – me at the back wearing my rucksack, foot on the exhaust because there was no room for me on the seat, clinging desperately to my husband. I have no idea what these are called but I did get a lift in one on Koh Yao Noi – so uncomfortable, but I laughed so hard! When we stopped at the first traffic light, I realised – after a bit of pointing and sniggering – that my helmet was on backwards and upside down. The journey lasted around twenty minutes, although it seemed much longer. We probably should have been scared but we were laughing so hard, I think we forgot to be concerned! On arrival, it was a source of much amusement to our Thai hosts – but thankfully, we didn’t have to repeat it on our return! If you think that sounds scary, watching the traffic as a pedestrian is even scarier. In Bangkok we saw four people to a scooter, plus a tiny baby who couldn’t have been more than a few weeks old, ride along the pavement and out into four lane traffic – not a helmet between them. Then there were the pickup trucks filled to the last with the food and cooking equipment for a street stall, with the family squashed in and piled on top – the kittens or puppies included. Using the public transport system was easy, efficient and cheap – and we got to spend time with people we might not have otherwise crossed passed with. We covered quite a bit of ground in Thailand, and although there are scams out there, you just need to use a bit of street smarts to make sure you get on the right mode of transport, at the right price. Forget the ticket offices and tourist information centres – they’re just adding on big fees for a quick phonecall – go to the source and buy direct. Thailand is known for its friendly people, so you’ll always find someone willing to help. And you’ll probably benefit from an extra adventure or two along the way. Can you use social media wisely? Fact is stranger than fiction Elizabeth, I really am enjoying your holiday.